Many of the blogs I follow have recently had a list of Questions & Answers about their horse life. I wanted to play along, but I don't have a lifetime of horse memories, being that I just got my first horse as an adult ten years ago. So I revised the questions a bit, so I could play, too! 1. How old were you when you first started riding & if there was a break from when you were a child rider to an adult rider, when as an adult, did you start riding again? 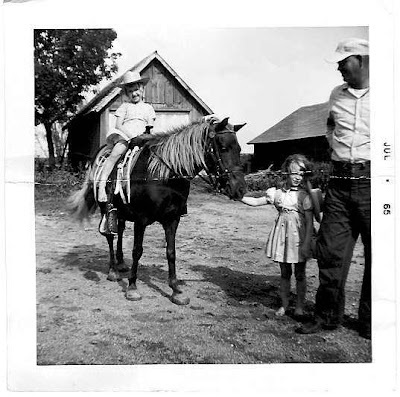 I must have been around 4 or 5 when Dad got us our first pony. Don't know how long we had them -- and the one we had the longest, wasn't as nice as the first one. When I was 39, we brought home Ginger & Baby and a few months later, bought Blue. That was almost 10 years ago. I'm on Dolly, my sister, Ann & Dad. Note the bare feet! 2. First horse ridden that you remember? That same pony in #1. Her name was Dolly. She was a former carousel pony and would just trot around and around in a circle. She was chocolate colored with dapples with a silver mane. 3. First Horse fallen off of? That would be Dolly's baby, Misty. Nasty, nasty pony. She ran me under the cattle oiler, the tree, along fences and just plain bucked! 4. Most recent horse fallen off? I'd like to say Black, but I had that embarrassing moment at the end of my driveway last month when I fell off Windy! 5. Most terrifying moment you ever experienced on a horse? When the thoroughbred, Nick, reared up and fell over with me on the side of a hill. I remember thinking "this is not good", as that large chestnut body came crashing down on me. Surprisingly, just bruised my hip is all. It was on a huge trail ride & I had an audience of about 100 riders! 6. Do you/have you taken lessons? Yes. But only recently. I wish I would have taken them when I got my first horse 10 years ago. I would be so much more ahead of the game! 7. Do you ride English or western? Western. But I do have an English saddle & have used it occasionally when riding Windy. 8. Ever been to a horse camp? Not as a child. As an adult, we went to Golden Hills in Missouri which is more like "a camp" than "going camping". There were daily activities such as clinics, cattle drives, team penning and poker runs, to name a few. It was great fun! 9. Ever participated in a riding clinic? Yes. And after every one, I say "this is going to be my last!" It's not that I don't learn anything from the clinics. I just feel like such a loser (Big L on forehead) while it is going on! And of course, my bestest, smartest horse always earns a scarlet L under their forelock, too. 10. Who was the first horse you owned as an adult? The first "family" horses we got were Ginger & Baby. But Blue was the first horse that was truly mine. And we still have these three horses today. 11. Ever competed in pony games, relay races, etc.? 12. Ever fallen off at a show? (Big Sigh.....) Yes. Off my horse, Bo. We were doing poles (at a walk or trot :) and he slipped turning the end one and I kind of rolled off. 15. Have you ever done dressage? 16. Do you jump and if so, how high? Not intentionally! But I have graduated to jumping logs on the trail rather than stepping over them. 17. Do you wear a helmet? 18. Have you ever ridden at night? Yes. The first by accident when we went out too far at Indian Cave and didn't make it back before the sun set. It was so dark in the trees. 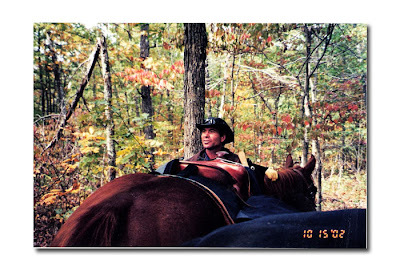 We had never ridden there before and had to trust the horses to find the way back. They did. The first planned night ride was our Blue Moon ride at Rock Creek. The last couple of years we have rode Oak Creek on full moon nights and we now have a traditional night ride at Cowgirl Weekends. 19. 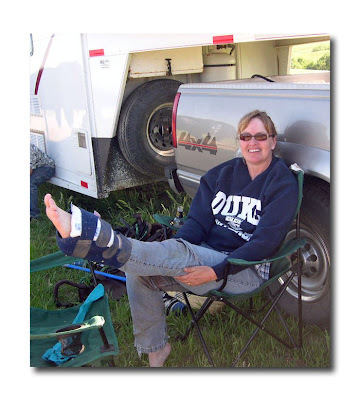 Most serious equine related injury you sustained? When Ginger clipped my ankle & broke my fibula in 2005. But I am sure this past fall, if I had not been wearing a helmet when I was thrown from Black, that would have been my most serious accident ever. I have no doubt about it! 20. Do you prefer arena riding (show or games) or trail riding? 21. Have you ever been bitten by horse? Yes. Nasty Misty from Question #3. 22. Ever had your foot stepped on by a horse? 23. What is your greatest horse fear? Whether it be a buck, bolt or rear -- just losing control and trying to ride it out or hoping I don't die when I land. 24. 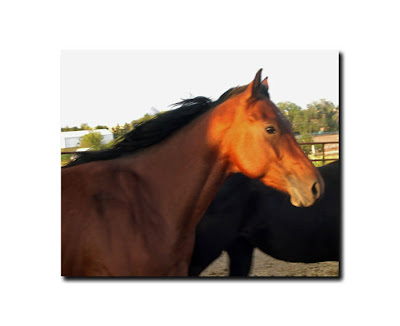 Besides the obvious (unbroken, crazy horses), is there any horse you are familiar with – maybe even fascinated with – but would not ride and why? And no, I'm not thinking of any horse in particular, but Arabians frighten me. Their animation and energy make me nervous. Also, very big horses. 25. What memory stands out as the most fun you’ve had on your horse? I have many wonderful memories. Riding Harney Peak last year is probably at the top. It was beautiful scenery, the horses were awesome in what was probably their highest climb in their lives. The kids were old enough to appreciate where we were at and the beauty all around us. And we were with good friends. Yeah, that's right up there. Cowgirl Weekend 2006 at Valentine was Windy's first solo CGW and she earned her stripes. And our first trip to Golden Hills back in 2002. The leaves were changing color and the trail looked different every day. We rode for a week solid! Wish I was doing Trail Time then! Losing Gunner in a pasture accident. 27. Moment that took your breath away? Opening up Ginger at Cowgirl Weekend 2004 - Big Canyon. There was a rattle snake that some of the cowgirls were quite fascinated with. I wasn't. I could see Sam and some others over yonder on the next hill and a nice dirt path/road in between us. It's the first and last time I ever ran Ginger that fast. And I'll never forget the feeling. I felt like we were flying! Yes, it took my breath away! Seabiscuit or Horse Whisperer. I loved both the books and the movies brought them to life for me. Anyone wanting to use this abbreviated version of this questionnaire are more than welcome. Leave me the link to your blog in the comments section so I can see your answers, too. Thoroughly enjoyed learning more about your past experiences involving horses. Very cool! Thanks for sharing your horse history! That's a gerat shot of Windy and Blue together. I grew up on a ranch in eastern Montana and rode horses to gather cattle for branding & shipping, but haven't been on a horse in many years now. I'm fascinated by the old-time cowgirls, though, because my grandmother rode steers in MT rodeos during the 1920s. Really enjoyed your answers to the questions that are "going around" and that you modified. 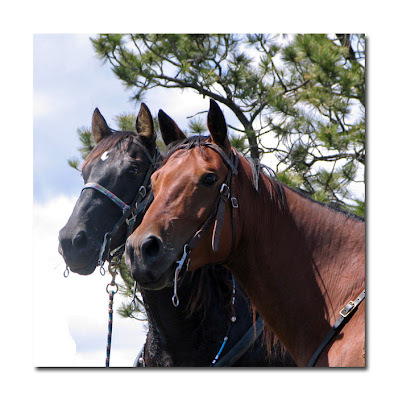 From some of your answers I felt that you might like Basic Training for a Safe Trail Horse with subtitle of Eliminating the Fear Factors. 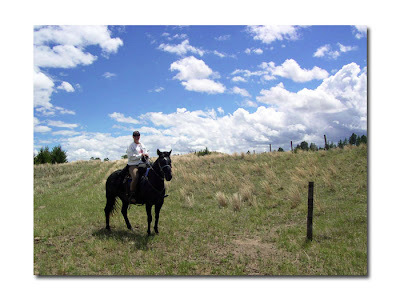 It is a small paperback narrative with instructions about how to teach a horse to be safe for trail riding without having to use bits, spurs, longe lines or round pens. It is available on Amazon and from the author at safetrailhorse@gmail.com. If you would like to read a review there is one under Horse Books on the blog by Nuzzling Muzzles. Cool questions and answers! Just FYI the first place I saw the questions was at Glenshee Equestrian. I'm always glad to see other "late riders" - makes me feel like I wasn't the only person who didn't have lessons as a teenager! I would go to a clinic. I'd feel like a huge dork and my horse and I would both get big red L's, but I'd go anyway. I try to just ignore feeling like a doofus and focus on learning something - I don't know much, so if I concentrate I can learn more than everybody else, right?! Meals for the Friday Before Mother's Day Ride! Opening Ride of the Season!